A USERFORM TEXTBOX INCLUDES THE USUAL NUMBER VALIDATION TECHNIQUES, YET ACCEPTS A NUMBER WITH A TRAILING MINUS SIGN. HOW CAN THIS BE? Both functions classify the trailing minus string expression as a numeric value. These, and other examples are described in code 1. 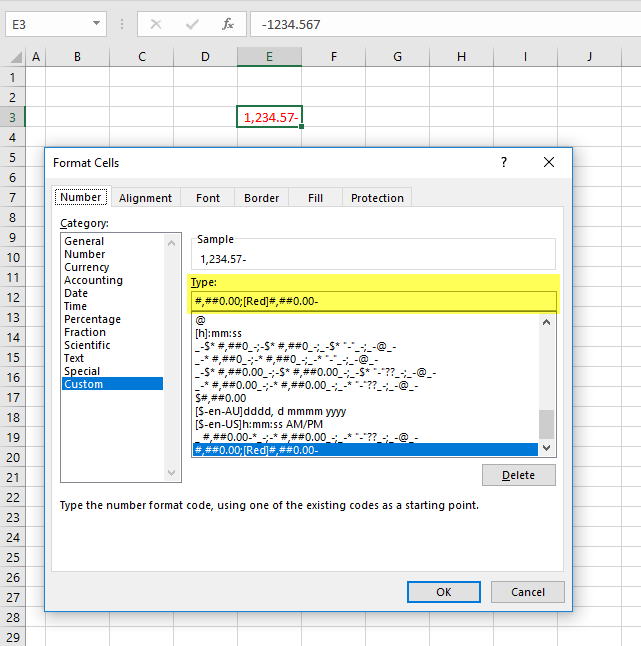 Num(1, 1) = "123.45-": Num(1, 2) = TypeName(Num(1, 1))                      ' Returns: 123.45-: "String"
Num(11, 1) = VBA.IsNumeric("123.45-"): Num(11, 2) = TypeName(Num(11, 1))    ' Returns: True: "Boolean"
Num(12, 1) = VBA.Val("123.45-"): Num(12, 2) = TypeName(Num(12, 1))          ' Returns: 123.45: "Double"
Num(2, 1) = "123.45-" / 1: Num(2, 2) = TypeName(Num(2, 1))  ' Returns: -123.45: "Double"
Num(3, 1) = "123.45-" * 1: Num(3, 2) = TypeName(Num(3, 1))  ' Returns: -123.45: "Double"
Num(4, 1) = --"123.45-": Num(4, 2) = TypeName(Num(4, 1))    ' Returns: -123.45: "Double"
Num(5, 1) = VBA.CDbl("123.45-"): Num(5, 2) = TypeName(Num(5, 1))    ' Returns: -123.45: "Double"
Num(6, 1) = VBA.CSng("123.45-"): Num(6, 2) = TypeName(Num(6, 1))    ' Returns: -123.45: "Single"
Num(7, 1) = VBA.CDec("123.45-"): Num(7, 2) = TypeName(Num(7, 1))    ' Returns: -123.45: "Decimal"
Num(8, 1) = Application.Sum("123.45-"): Num(8, 2) = TypeName(Num(8, 1))                 ' Returns: Error 2015: "Error"
Num(9, 1) = VBA.Format(-123.45, "#,##0.00;#,##0.00-"): Num(9, 2) = TypeName(Num(9, 1))  ' Returns: 123.45-: "String"
Num(10, 1) = DemoTM.TrailingMinus(-123.45): Num(10, 2) = TypeName(Num(10, 1))           ' Returns: 123.45-: "String"
Else                                                    ' Better to use the format function - see Num(9) - with argument "#,###.####;#,###.####-"
Details of the properties used in this module.